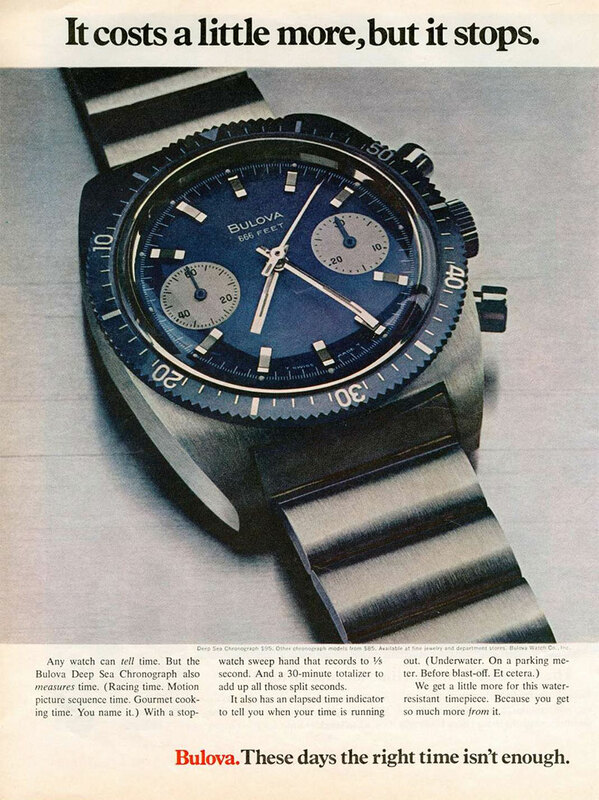 Bulova 1970 Deep Sea Chronograph "A"
Thank you :D I need a new bezel and anew band. If anyone can help please do!! I have a 20mm genuine vintage Tropic 2000 from the late 1960's, early 1970's in excellent condition, if you are interested. Deep Sea Chronograph works for me. Nice one! No! not a Deep Sea Chonograph, Deep Sea has never been found shown in this color / dial combination. I have to agree with Geoff . Even though it could very well be a Deep Sea there is no evidence to support the dial colors. The Bezel looks like a match to the ad, as does the signature "666 Feet" but that's not enough for an ID. Not Deep Sea Chrono. Different case, different dial, different bezel. I'd have to agree with generic Chrono. Too many differences in the Deep Sea, despite the same depth rating. OK Good reasons. Thanks for putting "reasons" for opinions in your comments. I'm changing my vote to chorongraph.